This blog was written by Dr Ricardo Sabates and Dr Nidhi Singal from the Faculty of Education and members of the Research for Equitable Access and Learning (REAL) Centre, University of Cambridge. They would like to thank the ASER Pakistan team, especially Baela Raza Jamil, Sahar Saeed and Afzan Munir. Regular monitoring of children’s school attendance and evaluation of their progress is important for teachers and educators, as well as for school inspectors, educational planners and policymakers. Data on attendance and learning outcomes helps evaluate the effectiveness of education systems in responding to diverse learning needs. Historically, children with disabilities have remained invisible in such efforts. However, attention is now being focused on the development of inclusive, equitable and quality education systems (Sustainable Development Goal 4); and while ensuring that children with disabilities are attending school, learning is now of paramount consideration. One way of ensuring this is to collect learning assessment data in a manner which can be disaggregated by disability. Over the last decade, the Annual Status of Education Report (ASER) in Pakistan has been tracking the educational status of children in the country. In 2014, ASER Pakistan took an important step and introduced the Washington Group Short Set of Questions on Disability for children living in the rural region of Punjab. A few additional questions were also included, to make the module more appropriate for children. An important caveat is that these questions do not provide a disability diagnosis. Rather, they assess functional difficulties in different domains, including hearing, vision, walking, self-care, understanding, etc. The degree or scale of difficulty ranging from none, to mild, to moderate/severe in any one or more of the functioning areas, is also recorded. The purpose is to identify the sub-population of children who are at greater risk of exclusion or limited participation in an unaccommodating environment, than other children of the same age. Does school enrolment have an impact on the acquisition of basic numeracy and literacy skills? Has the acquisition of these basic skills improved over time? The latest information (2018) from ASER Pakistan is being used to estimate whether children with disabilities are learning in schools. The data covers over 119,000 children, living across three provinces (Punjab KP) and the Islamabad Capital Territory (ICT) with an incidence of nearly 1% of moderate/severe difficulties (3.56% of the sample reported some form of disability). Our results show that basic numeracy and literacy levels, particularly the ability to identify numbers 0 to 9 and to recognise an alphabet were higher among children identified as having moderate/severe difficulties who attended schools, compared to their peers with the same levels of identified difficulties, who were not attending school (see Figure 1). For instance, 48% of children with moderate/ severe difficulties who were in schools in Grade 1, were able to perform foundational numeracy tasks. This was in contrast to just 32% of children aged 5 with similar levels of difficulties, who were out of school, and just 26% of children aged 5 with similar levels of difficulties who had never been to school. For higher grades of basic education, children with moderate/ severe difficulties managed to achieve foundational literacy, but this was not the case for children with moderate/ severe difficulties who remained out of school. Other data sets collected in Pakistan also highlight that children show learning gain when in school, despite having moderate/ severe difficulties. Evidence clearly shows that being in school matters for learning for all children, including those with disabilities. The right to education for all is central in achieving this. While data shows that being in school matters, enrolment rates for children who were identified as having moderate/ severe difficulties, varied significantly across the provinces. In Punjab, 75% of children with moderate/ severe difficulties were enrolled in school, though this figure fell to 69% in Khyber Pakhtunkhwa, 66% in the KP-newly merged districts (previously FATA) and 57% in Islamabad Capital Territory (ICT). 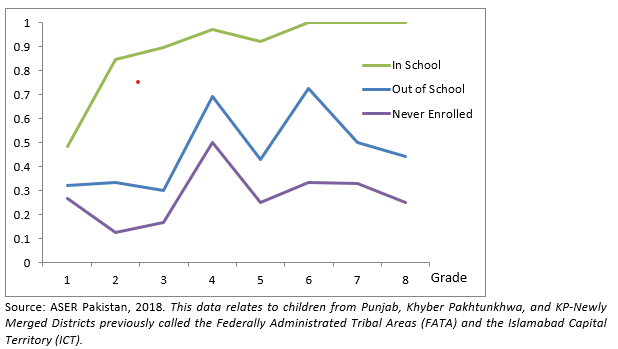 Over the period of 2014-2018, we were able to capture changes in enrolment over time for children living in Punjab and Khyber Pakhtunkhwa. In Punjab, we noted a steady increase in enrolment rates for children with moderate/ severe difficulties: in 2014, 70% of these children were enrolled in school, compared with 72% in 2016 and 75% in 2018. However, this was not the case for children with moderate/ severe difficulties in Khyber Pakhtunkhwa, where enrolment remained unchanged at around 69%. Given that schooling is a provincial matter in Pakistan, these variations are of particular relevance. Data on learning levels over the last four years for Punjab shows an increase in the proportion of children with moderate/ severe difficulties who are able to achieve basic numeracy and literacy. In 2014, only 35% of children with moderate/ severe difficulties living in Punjab were able to identify numbers 0 to 9. In 2016, this rose to 59% and in 2018 to 74% – an impressive achievement. In Khyber Pakhtunkhwa, the proportion of children with moderate/severe difficulties who displayed basic numeracy rose from 58% in 2016, to 67% in 2018. An increase in learning levels is seen for basic literacy too, but to a smaller extent than that seen for numeracy. While there have been improvements for children with moderate/ severe difficulties, gains have not been as large as for children who reported no difficulties. In Punjab, for instance, nearly 71% of children with no difficulties were able to undertake basic literacy tasks in 2018, compared with 58% of children with moderate/ severe difficulties. In Khyber Pakhtunkhwa, 61% of children with no difficulties were able to display basic literacy, though only 53% of children with moderate/ severe difficulties could do so. Thus, even when there have been learning gains, the children who were identified as having moderate/ severe difficulties continue to lag behind. It is important to emphasise here that these low levels of learning are not simply attributable to disability as an independent variable. Rather, these findings, as qualitative school-based research has shown, are an indication of systemic inefficiencies, such as quality of teaching, lack of teaching-learning materials and teacher content knowledge. With these factors at play, the situation becomes even more critical for children with disabilities. We acknowledge that we did not use the complete Child Functioning Module (CFM) as part of the ASER Pakistan survey. Rather, we relied on the Washington Group Short Set with added questions from the CFM, due to issues of space in the survey. Additionally, the assessment tests themselves were not adapted for children with disabilities and focused only on basic numeracy and literacy, even though learning in school leads to a whole range of important and diverse gains. Nonetheless, we argue that while literacy and numeracy are not sufficient in themselves, they are the backbone of the learning experience. Additionally, we did not find any stark differences according to gender. Improvements in access and learning are slower for children identified as having a range of moderate/ severe difficulties. Despite overall increases in enrolment and learning gains in schools, children with moderate/ severe difficulties are less likely to benefit equally from these positive changes. While such disaggregated data is essential, we must also push for better understanding of school based processes in order to bring about change. As Pakistan, like many other countries, puts in place educational policies to support education for all children, including for those with disabilities, it is vital that these challenges are addressed. The United Nations Committee on the Rights of Persons with Disabilities (UNCRPD) General Comment 4, 2016 clearly noted, “Inclusion involves a process of systemic reform… with a vision serving to provide all students of the relevant age range with an equitable and participatory learning experience and environment that best corresponds to their requirements and preferences. Placing students with disabilities within mainstream classes without accompanying structural changes to, for example, organisation, curriculum and teaching and learning strategies, does not constitute inclusion”. A fascinating study with many important implications. Thank you!